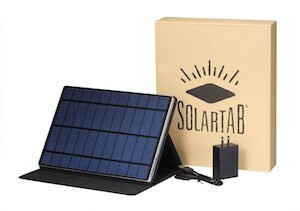 If you want free power then a solar panel is one way to go and if you are looking for a way to keep your phone and tablet charged then the Solartab can be perfect for you. The Solartab is 9.53 x 6.97 inch giving it plenty of space to catch the sun and the build in cover protects it when you travel but when you want to charge the build in battery then it acts as a stand. The Solartab has a 13,000 mah battery build in so that even in the dark you can still charge your devices. Come and check out the Solartab Solar Charger With Build In Battery.